Protein effectors of pathogenicity are instrumental in modulating host immunity and disease resistance. The powdery mildew pathogen of grasses Blumeria graminis causes one of the most important diseases of cereal crops. B. graminis is an obligate biotrophic pathogen and as such has an absolute requirement to suppress or avoid host immunity if it is to survive and cause disease. Here we characterise a superfamily predicted to be the full complement of Candidates for Secreted Effector Proteins (CSEPs) in the fungal barley powdery mildew parasite B. graminis f.sp. hordei. The 491 genes encoding these proteins constitute over 7% of this pathogen’s annotated genes and most were grouped into 72 families of up to 59 members. They were predominantly expressed in the intracellular feeding structures called haustoria, and proteins specifically associated with the haustoria were identified by large-scale mass spectrometry-based proteomics. There are two major types of effector families: one comprises shorter proteins (100–150 amino acids), with a high relative expression level in the haustoria and evidence of extensive diversifying selection between paralogs; the second type consists of longer proteins (300–400 amino acids), with lower levels of differential expression and evidence of purifying selection between paralogs. An analysis of the predicted protein structures underscores their overall similarity to known fungal effectors, but also highlights unexpected structural affinities to ribonucleases throughout the entire effector super-family. Candidate effector genes belonging to the same family are loosely clustered in the genome and are associated with repetitive DNA derived from retro-transposons. We employed the full complement of genomic, transcriptomic and proteomic analyses as well as structural prediction methods to identify and characterize the members of the CSEPs superfamily in B. graminis f.sp. hordei. Based on relative intron position and the distribution of CSEPs with a ribonuclease-like domain in the phylogenetic tree we hypothesize that the associated genes originated from an ancestral gene, encoding a secreted ribonuclease, duplicated successively by repetitive DNA-driven processes and diversified during the evolution of the grass and cereal powdery mildew lineage. The powdery mildew fungus Blumeria graminis is an obligate biotrophic pathogen of cereals. It has significant impact on cereal crops that are central for food security such as wheat (Triticum aestivum) and barley (Hordeum vulgare) and is an experimental model for powdery mildew fungi in general as well as for other obligate biotrophic plant pathogens. Here we research the barley pathogen B. graminis f. sp. hordei. Its infection process starts when a spore lands on a leaf, germinates, forms an appressorium and attempts plant cell penetration. The penetrating hypha produces a specialized feeding organ, the haustorium, in the host epidermal cell. The haustorium remains surrounded by a plant-derived extra-haustorial membrane. Between the haustorium and the extra-haustorial membrane there is an extra-haustorial matrix, which is the interface between the two organisms. Both the plant and the fungus are dedicated to secretory warfare and the extra-haustorial matrix is believed to represent a major battleground. Effector proteins are defined as molecules that alter host cell structure or function, and thereby facilitate infection and/or trigger defence responses. Effectors are therefore assumed to be secreted by the pathogen. In plant pathogenic fungi, they are broadly divided into apoplastic and cytoplasmic effectors depending on their final destination in the host. Apoplastic effectors often exhibit inhibitory activity against extracellular host hydrolytic enzymes (e.g. proteases) and are typically small and highly cysteine-rich secreted proteins. Most cytoplasmic effector proteins have been identified through their avirulence functions, i.e. based on their genotype-specific recognition by matching plant resistance (R) proteins. Little is known about their direct host targets; some have a functional nuclear localization signal (NLS) suggesting a nuclear target. 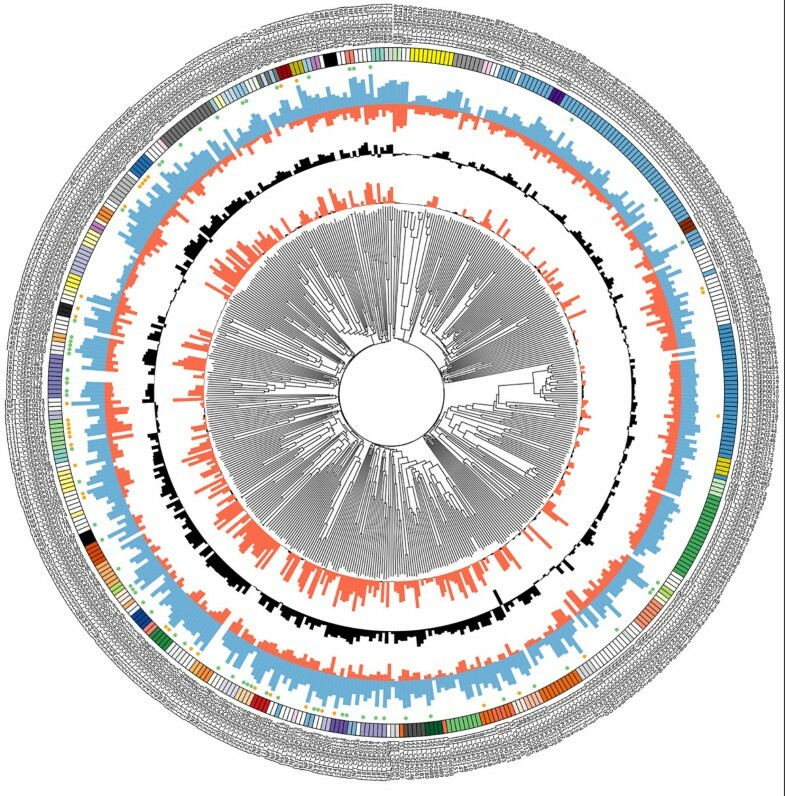 Godfrey and co-workers recently identified 107 effector candidates based on a cDNA library prepared from barley epidermis containing haustoria. All these effector candidates share an N-terminal amino acid motif named YxC, consisting of a conserved aromatic amino acid (Y, F or W) followed by any amino acid and then a cysteine. Seventy-one of these B. graminis effector candidates were verified experimentally in the haustorial proteome present specifically in the epidermis of infected plants, of which 51 contain the YxC motif[7, 8]. The observation that only three candidate effector proteins were found in the proteome of isolated haustoria, in the preparation of which secreted proteins are mostly likely to be washed away, provides indirect evidence that these candidate effectors are indeed secreted by the fungus. As one outcome of the recent sequencing of the B. graminis genome, we reported the annotation of 248 C andidates for S ecreted E ffector P roteins (CSEPs), de-fined as proteins with a predicted signal peptide, but no transmembrane domain and no homology to proteins outside the Erysiphales (powdery mildews). Here we provide a global survey of the CSEPs in the B. graminis genome, transcriptome and proteome. We studied their predicted structures and putative functions, and explored evidence for selection acting on their diversification. Based on the results of these analyses we discuss how these key proteins may have evolved in the interplay with the host systems. Initially, we aimed at determining a comprehensive set of all B. graminis CSEPs. To achieve this, we followed two complementary strategies: We first mined the B. graminis genome by iterative BLAST searches using previously identified CSEPs as query sequences. We then performed open reading frame (ORF) prediction in combination with SignalP analysis based on whole transcriptome shotgun sequencing (RNAseq) data (Figure1). After three rounds of iteration we identified 491 manually annotated CSEPs including the 248 predicted previously (Additional file1). Based on Markov Clustering (MCL) analysis, 407 of the predicted 491 CSEPs were grouped into 72 families (BLASTP threshold e<10-10; Table1, Additional files2 and3). Approximately 50% of the families have two to ten members (including a total of 242 CSEPs), and seven families are comprised of eleven or more members (representing 165 CSEPs). CSEPs make up a considerable proportion of the large protein families in B. graminis, as this fungus only has a total of 25 protein families of ten or more members estimated by MCL-based clustering of the entire theoretically determined B. graminis proteome. Most families harboring CSEPs are nearly exclusively comprised of effector candidates, but the largest CSEP-containing family encompasses only ~50% CSEPs. The remaining members of the latter family lack a significant SignalP score for a canonical N-terminal signal peptide, suggesting either false-negative predictions or functional diversification within this protein family. In addition to the MCL-based family grouping, we conducted neighbor-joining phylogenetic analysis of the 491 CSEPs and established a CIRCOS plot (Figure2), which illustrates their relatedness as a dendrogram. Owing to the high sequence diversity amongst the CSEPs this approach does not accurately resolve their phylogenetic relationships, but rather visualizes clusters of similar sequences within the CSEP superfamily. Bootstrap analysis indicates largely reliable family classification, while the relatedness of the families amongst each other is less well determined (Additional files4,5 and6). The clades resolved by two independent methods (MCL clustering and phylogenetic classification) are largely congruent, indicating robustness of the overall family groupings. Even though, by the definition used in the context of this study, the CSEPs do not have evident homologs outside powdery mildew fungi, we inspected their amino acid sequences for signatures of known protein domains. InterProScan analysis combined with gene ontology (GO) categorization revealed that 54 CSEPs are similar to proteins with RNA binding and/or ribonuclease activity (see below), while nine have predicted coiled coil domains (Additional file1). Such similarities to RNA binding/ribonuclease activity were found in 27 of the 32 members of MCL family 2 and in 11 of the 20 members of MCL family 3. The remaining 16 of these CSEPs are scattered across eleven other families (Additional files5 and7). We then searched for CSEP homologs within the Erysiphales by examining the proteomes derived from sequenced genomes of Golovinomyces orontii and Erysiphe pisi representing two other genera in this order. 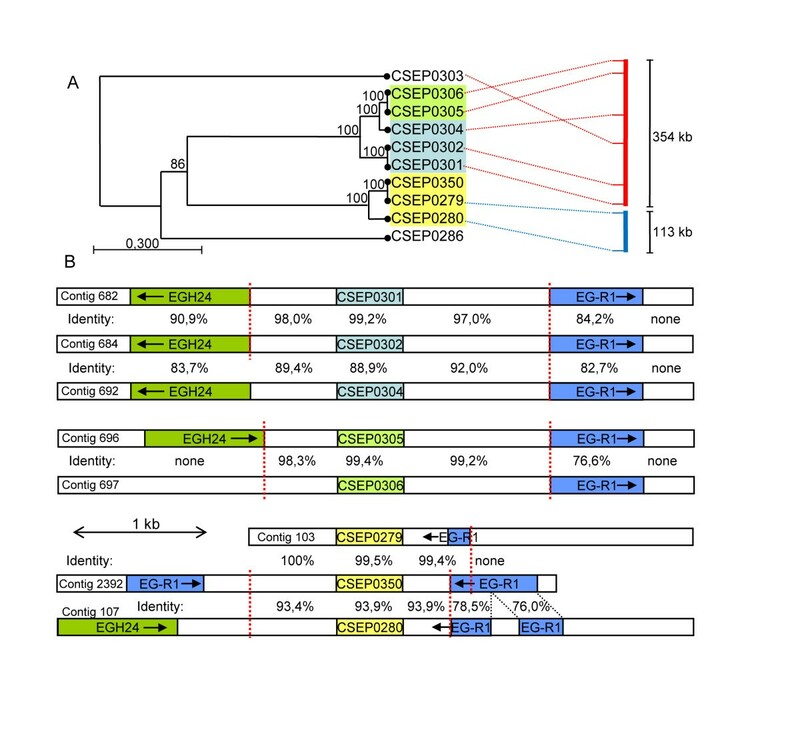 This revealed that 16 of the B. graminis CSEPs are similar (TBLASTN, e<10-05) to proteins encoded by Golovinomyces orontii (two), Erysiphe pisi (four) or both (ten). Interspecies amino acid sequence identities of these ranged from 31% to 73% with an average of 48%. These 16 B. graminis CSEPs are mainly unrelated singletons, widely distributed across the phylogenetic tree (Additional file6). This result is consistent with the previous analysis of 248 CSEPs, and it further underscores rapid evolution and diversification of CSEPs in powdery mildew genomes. 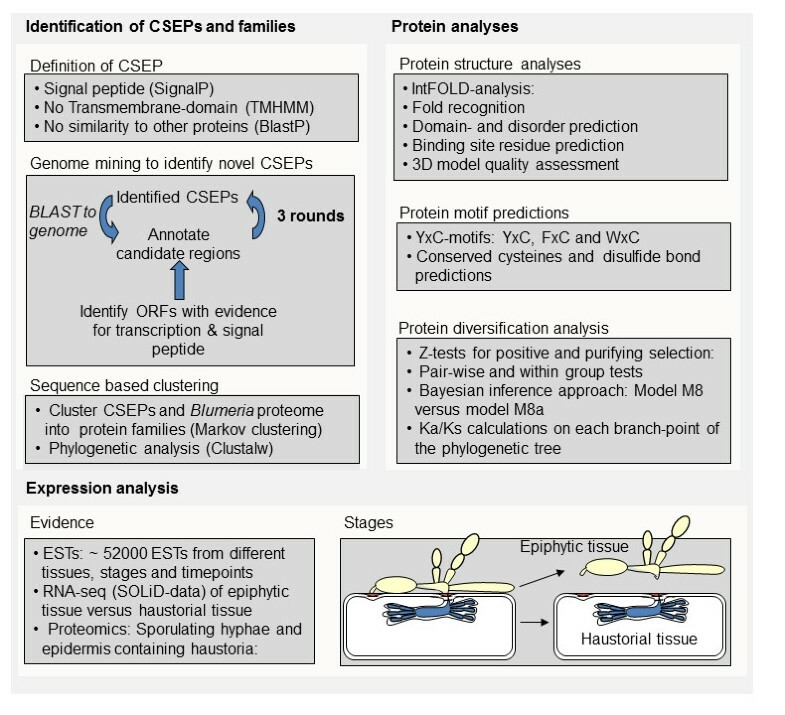 Summary of bioinformatics and expression analysis of CSEPs. Identification of CSEPs and family assignment. Workflow used to find and annotate CSEPs in the genome of B. graminis f.sp. hordei. After three iterative rounds of BLAST and annotation, genes were clustered into families as described in Methods. Protein analyses. The proteins predicted to be translated from the CSEP ORFs were analyzed to infer their 3D structure and presence of conserved motifs. These were then used to investigate evidence of different selection pressures during the course of evolution of the CSEP families. Expression analysis. Evidence to support the existence of CSEP genes was obtained from ESTs in the public databases, from RNAseq surveys and from the analysis of the proteomes of B. graminis and B. graminis-infected barley tissues by mass-spectrometry. The 35 CSEP families with four or more members. The table summarizes data from gene- and protein expression as well as protein length, conserved cysteines, YxC-motif and detection of positive selection within each family. Data of families showing positive selection in the overall z-test are indicated in bold fonts. A table with more extensive details of the CSEP family analysis is provided in the Additional Files (Additional file1). 1) Indicates the type motif in the N-terminus of the mature protein 2) The presence of a cysteine close to the C-terminus and the distance to the C-terminus is indicated in brackets 3) Number of conserved cysteines in the mature protein. 4) Length of proteins (number of amino acid residues): The average lengths of the proteins were calculated for each family. 5) Gene expression ratio in haustorial samples versus epiphytic samples, calculated as averages for each family. 6) Percentages of CSEPs in each family found only in haustoria-samples by proteome analysis. 7) Numbers of pairs with significant positive selection (z-tests at 5% level) compared to the total number of pairs within each family. 8) Family averages of mean Ka/Ks-values calculated on the mature proteins. CIRCOS plot of the CSEP superfamily with expression and proteome data. From the perimeter to the centre: The outer ring identifies the CSEPs. The rectangles in the circle immediately below the identifiers are colour-coded: CSEPs of the same families have the same colour. The small circles below the family identifiers indicate the proteins identified by mass spectrometry in infected epidermis only (green) or in both infected epidermis and epiphytic hyphae (yellow). The first and second data histogram circles shows the expression values of the haustorial samples (blue) and of the epiphytic samples (red) of each CSEP gene on a log2 scale. The third data histogram (black) represents the ratio of the expression values in the two stages plotted on a log2 scale. The fourth data circle indicate the statistical significance of the ratios (red, significant/black non-significant). At the centre is a dendrogram based on the neighbour-joining dendrogram of all CSEP paralogs. Many (51%) of the CSEPs are represented in Expressed Sequence Tag (EST) collections available in databases (Additional files1 and8). The EST sets with the highest proportion of CSEP transcripts are derived from cDNAs from haustoria-containing epidermis and 162 CSEPs (33% of the 491) were found in these EST collections (Additional file1, column W and Z). In order to further characterize the CSEP expression patterns and validate their annotation, we analyzed RNAseq data obtained from two separate B. graminis tissues isolated at 5 d after inoculation: (1) haustoria-containing plant epidermis and (2) epiphytic structures. Ninety-seven percent (477/491) of the CSEP show clear evidence of expression in one or both of these structures (Figure2). Expression ratios in haustoria versus epiphytic structures revealed that most CSEP RNAs were significantly more abundant in the haustorial samples (Figure2 and Additional file9), including 216 out of 349 CSEP RNAs that were at least 10-times more abundant in haustoria (e.g. the CSEP RNAs in families 1 and family 2, Figure2). By contrast, in families 7, 11, 57 and 68 the majority of genes showed similar transcript levels in both fungal tissues. Interestingly, the CSEP RNAs not assigned to specific families (singletons) were also expressed at similar levels in the two samples. A large-scale mass spectrometry-based proteomics approach allowed us to map peptides derived from expressed proteins on the B. graminis genome, validating ORF models through the experimental evidence of protein accumulation[8–10]. Moreover, revisiting the previously analyzed proteomes of haustoria-containing epidermis and epiphytic structures, using updated genomic information, revealed the existence of 97 CSEPs at the protein level (Figure2 and Additional file1). Of these, 62 CSEPs (64%) were only detected in the haustoria-containing epidermis. We analysed nucleotide sequence diversity in coding and non-coding sequences of CSEP paralogs. Unexpectedly, we observed that many CSEPs diverged more markedly in the coding regions. For example, we noticed that the sequences in families 8 and 30 are strikingly more different in the two exons than in the intron and the up- and down-stream non-coding regions (Additional file10). We then used three different approaches to test whether positive diversifying or purifying selection has operated during the evolution of related CSEPs (Table1, Figure3B and3C, Additional files3 and11,12 and13; see also Methods for experimental details). This analysis assessed which amino acids in a family varied by random drift from those that have been subjected to purifying or diversifying selection. We expected purifying selection in the N-terminal signal peptide domains based on the need to maintain secretion and considered this as a positive control in our analyses. In general, there was good agreement between the three types of approaches. However, in some cases, we only found substantial evidence of positive diversifying selection for a small number of codons, and this was often not sufficient to make the z-test based on the entire ORFs significant. Overall, we found strongest evidence for diversifying selection in families 21, 23, 25, 29, 30, 50, but also statistically significant diversification in families 5, 8, 12, 13, 16, 22, 32, 34, 42, 44, 46 and 49 (Table1 and Additional file3). In these 18 families, representing 93 members, diversifying selection was a general trend. However, even in the three largest families, where purifying selection was dominant, there are individual residues that seem to have been under diversifying selection. Especially in family 1, there is a stretch of 20 amino acids showing signs of positive selection, while family 2 has 16 codons in several domains with diversifying selection scattered along the protein (Additional files12 and14). We then analyzed the relationships between CSEP length, the degree of inferred positive diversifying selection and transcript accumulation in haustoria based on the respective average for each family. 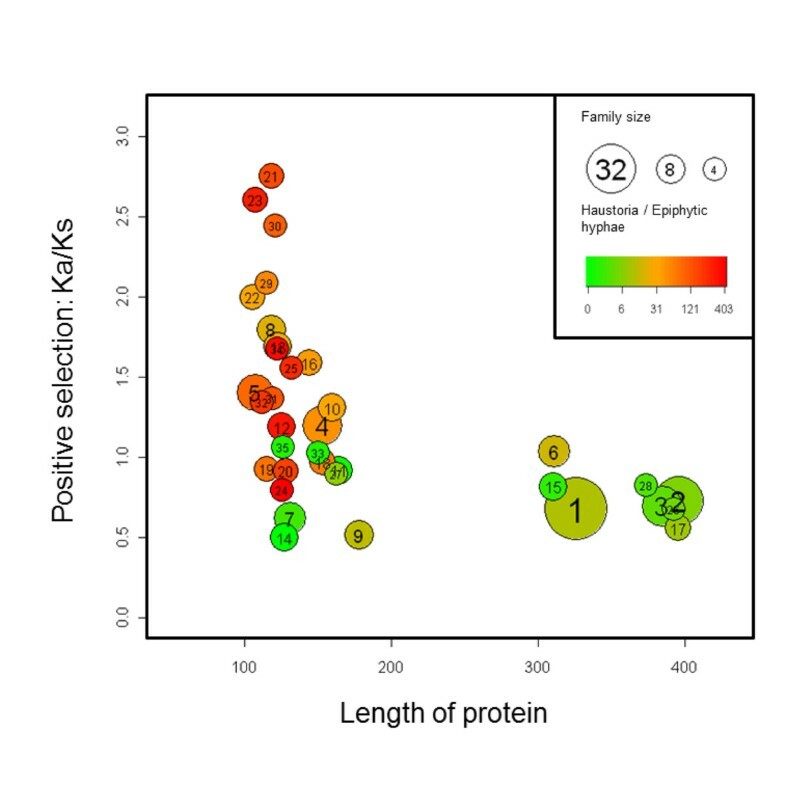 We found that the CSEP families form two clearly separated groups: one group contains shorter proteins with a preference for haustorial expression and with most families showing strong evidence of positive diversifying selection. The second group includes longer proteins with less evidence of differential expression and less overall positive diversifying selection (Figure4). The analyses also demonstrate that there has been purifying selection in all families. This is expected especially in the region encoding the predicted signal peptides and in some conserved motifs or specific amino acids (Additional files12 and http://13). In some families (7, 9, 14, 17 and 26) we detected only purifying selection. In other examples (e.g. family 6), the N-terminal part of the mature proteins is highly conserved and has been under strong purifying selection, while the C-terminal region appears to have been under positive diversifying selection. The most conserved amino acids are generally proline, glycine and cysteine (Figure3A, Additional files12,13 and14). These amino acids confer structural properties to proteins by providing fixed angle bends, sharp angle bends and opportunity for disulphide bonds, respectively. Protein structure and positive selection in CSEP family 12. A: Amino acid alignment of the seven members obtained with CLC main workbench (see Methods). B: Evidence for selection on the paralog members of family 12 was estimated using the Selecton server ([49, 50];http://selecton.tau.ac.il/). Codon sites under positive diversifying (red) or purifying (purple and yellow) selection and conserved cysteines (yellow) are indicated by coloured circles. C: Cladogram with Ka/Ks-values indicated for the individual branches calculated using the on-line server athttp://services.cbu.uib.no/tools/kaks. Branches in red indicate a significant positive selection. D: 3D protein models of two family 12 members are shown and the amino acids under positive diversifying selection are highlighted in red. The relationship between the length of CSEPs, the degree of positive selection and the ratio of expression in haustoria compared to expression in epiphytic hyphae. Ratio of the non-synonymous to synonymous substitutions (Ka/Ks) within CSEP families is plotted against the length of the proteins. The values of the parameters for the axes were calculated as family averages; the family numbers are indicated in the circles. The ratios of CSEP expression in haustoria and epiphytic hyphae are as indicated in the colour bar. The diameter of the circles indicates the relative size of the families. Since by selection the CSEPs had little sequence similarity (BLASTP, e<10-05) to any protein previously structurally or functionally characterized, we carried out structural annotation using protein fold recognition methods, to search for potential relationships based on predicted structure (Additional file15). The results of this structural annotation indicate that all CSEPs had comparatively low values for mean lengths, mean proportion disorder, mean maximum length of disorder, mean model quality and mean number of domains (Additional file16). For example, compared with a random set of 71 proteins only detected in the epiphytic hyphae, all values are significantly lower in the CSEPs. When we control for length, all values are lower except for length and number of domains. Overall there are no statistically significant differences (apart from three-dimensional (3D) model quality) between CSEPs, proteins found in haustoria and infected epidermis and known fungal effector proteins. Ribonuclease template assignments are significantly overrepresented in CSEPs compared with all other sets apart from proteins found in haustoria and infected epidermis (i.e. sets known to include CSEPs) and in a set of 71 proteins selected at random from yeast, where there is no significant difference with this data (Additional file17). Furthermore, assignments to hydrolase templates are significantly overrepresented in CSEPs compared with proteins from hyphae and a random set of yeast proteins (Additional file17). We mapped the position of the residues predicted to be under statistically significant positive diversifying selection pressure onto the predicted 3D models of the proteins. We observed a variety of scenarios exemplified by the following case studies. The highest quality 3D models generated for CSEP family 12 (Figure3 and Additional file11) are all predicted to have approximately similar folds and were generated using ribonucleases as the top identified structural templates. The positions of the residues calculated to be under positive diversifying selection mostly occupy the surface of the globular structures (Figure3 and Additional file18A, right hand side images). Furthermore, these amino acids are located mostly within the loop regions of the structures, whilst the α-helix and β-strand secondary structural elements (Additional file18A, left hand side images) are more conserved and contain residues under purifying selection. In other cases (for example family 21; Additional file18B), the more variable regions are located in α-helices and β-strands and residues under diversifying selection are buried in regions more likely to lead to changes in folding (Additional files11 and18B). The models generated for other families are shown in Additional files18C-E (see alsohttp://www.reading.ac.uk/bioinf/CSEPs/). We compared the CSEPs against the known fungal effectors and B. graminis proteins that were found only in haustoria and infected epidermis, as well as the yeast and hyphae controls sets. The parameters measured were: length (as a control), amino acid frequency (A-Y), coiled-coil composition, transmembrane (TM) helix composition (as a control), low complexity regions, frequency of helical residues, frequency of strand residues and frequency of loop residues. We found that particular amino acids (C, F, H, I, N, S, and Y) and loop residues are significantly overrepresented in CSEPs, while several other amino acids (A, D, E, G, and K) are significantly underrepresented (Additional files19 and20). The similarity between CSEPs, known fungal effectors and B. graminis proteins found only in haustoria and infected epidermis is particularly striking with regard to the significantly higher frequency of cysteine residues. Manual inspection of multiple amino acid alignments of the CSEP families revealed that the cysteines are generally conserved and most families (27 out of the 35 largest) had an even number of cysteines (Table1). Many CSEPs (307; 63% of the 491) contain the previously described YxC-motif within the first 30 amino acids of the mature protein sequence (i.e., from which the N-terminal signal peptide was removed; Additional file21). The frequencies of the three variants of this motif, YxC, FxC and WxC, are 47%, 49% and 4%, respectively. Of the 184 CSEPs without an N-terminal YxC-motif, there are 34 without any cysteine in the mature protein. In the remaining 150 CSEPs, 44 have a YxC-motif further towards the C-terminus. The latter is typical of the longer CSEPs (Additional file21). Most CSEPs contain a cysteine close to the C-terminus. For example, 83% of the 307 CSEPs with an N-terminal YxC motif also have a cysteine within the last 30 C-terminal amino acids. In 65% of those, the cysteine occurred within ten amino acids from the C-terminus, preferably in positions four to seven (Additional files14 and22). Of the non-YxC CSEPs, only 26% have a cysteine within ten amino acids from the C-terminus. The majority (90%) of all CSEPs have at least two cysteines and thus in principle they have the capacity to form a minimum of one disulphide bond. This overrepresentation of cysteines and their conserved pattern prompted us to predict disulphide bonds using the tool Disulfide Bonding State and Connectivity Predictor “Disulfind”, which previously has been used for prediction of disulphide bonds in effector candidates. We found that 69% of all possible disulfide bonds are predicted to be formed (Additional file22). The InterProScan analysis revealed that 54 CSEPs (57 proteins in the entire B. graminis proteome) show affinity to ribonucleases/ribotoxins (see above, IPR016191). Also the IntFOLD structural analysis (see above) indicated that many CSEPs matched ribonuclease structural templates, particularly those of two well-characterized ribonucleases: T1 from Aspergillus oryzae (11-times) and U2 from Ustilago sphaerogena (16-times; Additional file7). Thirty-seven CSEPs from many different families have top models of medium or high score in this category. Thus, two fundamentally different but complementary methods (InterProScan and IntFOLD) indicate the relatedness of a considerable subset of the CSEPs to ribonucleases. Based on the two procedures, we found that, across the phylogenetic tree, a total of 72 CSEPs, representing 15 different families and seven CSEPs not assigned to families, show similarity to ribonucleases, of which 35 were predicted by InterProScan, 18 by IntFOLD and 19 by both approaches (Additional file7). We aligned consensus sequences obtained from nine of these CSEP families with the well-described Aspergillus T1 ribonuclease and a consensus sequence generated from several other ribonucleases. In this multiple sequence alignment, we observed considerable similarity between CSEPs and ribonucleases at the level of the primary amino acid sequence, and we identified approximately eight to nine positions that are highly conserved (Figure5A). Moreover, the intron between the first and second exon of the ten CSEP families is at the same relative position. The predicted folds of some of the CSEPs are highly similar to that of ribonuclease T1 (Figure5B) showing that, even though their amino acid identities are only about 20%, their predicted 3D structures are well conserved. It is also noteworthy that the native ribonuclease fold includes a disulphide bond as predicted in many of the CSEPs (see above), further strengthening the degree of similarity between these proteins. Overall, this suggests that these families may have a common origin. Despite the similarities, it seems likely that the ribonuclease activity was lost in these CSEPs, since well-known active site residues are absent (Figure5A). Multiple sequence alignment and 3D models of ribonucleases and CSEPs. A: Multiple sequence alignment of ribonuclease T1 from Aspergillus oryzae, a ribonuclease consensus sequence and selected CSEP family consensus sequences. 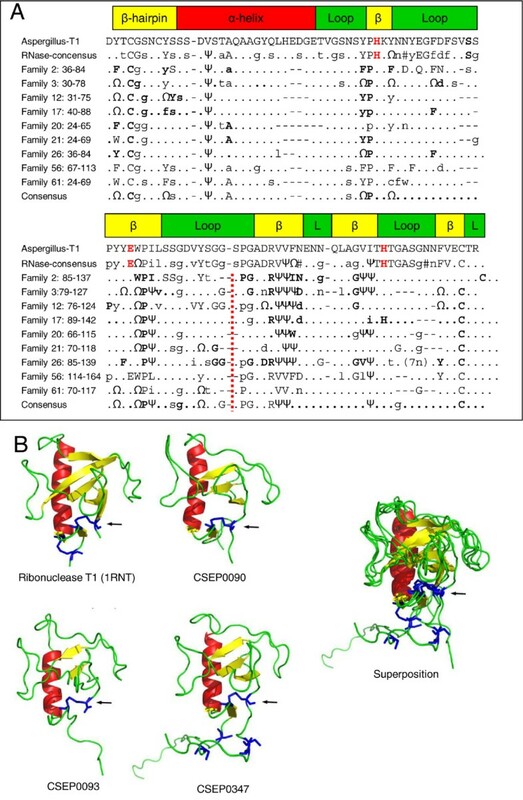 The ribonuclease consensus was derived by aligning ribonucleases from Aspergillus phoenicis (P00653, Penicillium brevicompactum (P07446), Grosmannia clavigera (EFX05096), Phaeosphaeria nodorum (XP_001800520) and Mycosphaerella graminicola (EGP89360). The alignments were manually edited based on MultAlin-alignments (http://multalin.toulouse.inra.fr/multalin/multalin.html). The CSEP families included are primarily those showing most ribonucleases identified by InterProScan or by the structural annotation. The secondary structures (α-helix, β-sheets and loops) of ribonuclease T1 from Aspergillus shown on top are according to Pace et al.. Catalytic active site residues in ribonucleases are indicated in red. Intron position is indicated by a red vertical dashed line; there is one exception, one member of family 56 does not have this intron. Amino acid numberings are the ranges for each family. Upper case letters indicate highly conserved positions, while lower case letters indicate that the positions are present in some of the family members only. Omega (Ω) is used for aromatic amino acids (F, Y and W), and psi (Ψ) is used for V, L and I. Letters in bold indicate that the positions are under purifying selection. Dots indicate non-conserved positions and dashes are gaps. B: 3D models of ribonuclease T1 and three CSEPs and their superposition. Arrows indicate the predicted disulphide bonds between the N- and C-terminal cysteines. The existence of discernible CSEP families suggests frequent gene duplication events during evolution of the B. graminis genome. To obtain clues about the underlying molecular mechanisms, we studied how CSEPs are organized in the genome. We analyzed in detail the distribution of 252 CSEPs belonging to 22 families, including the 16 largest families. We found that 207 genes (82%) are clustered family-wise on individual genomic sequence scaffolds (Additional file23). In some families most or all genes reside on a single scaffold. For example, six out of the seven genes in family 9 cluster on one scaffold, and in family 2 we found that 18 out of the 32 genes cluster on one scaffold within 1429 kb (Additional file24). The clusters with 2–18 members are on average 434 kb long and the mean distance between clustered CSEPs is 129 kb. In 13 cases gene-pairs are direct neighbors, separated by only 2–6 kb. Surprisingly, however, the most closely positioned gene pairs do not always encode the most closely related CSEPs. A comprehensive analysis of the distribution of all CSEPs showed that they are spread throughout the genome (Additional file25), but two thirds of the 455 CSEPs located on 43 major sequence scaffolds were clustered family-wise (Additional file25). The B. graminis genome is very rich in repetitive DNA sequences[10, 14] and two very frequent and widespread retro-transposons, Egh24 and Eg-R1, were previously characterized[15, 16]. During genome annotation, we often noticed that CSEPs are embedded in regions flagged as repetitive DNA. We further studied the three CSEP families already found to have highly similar 500 bp regions upstream and downstream of their exons in order to investigate how far the sequence similarities extend (Figure6 and Additional file26). Six of the ten family 7 members cluster on the same sequence scaffold as three pairs with more than 99% identity within the pairs, indicating recent gene-duplications. The very high sequence similarity extended only 1 kb or less up- and downstream of the coding region. Further away, most of the genes were flanked by one of the two SINE-type retro-transposons, Egh24 or Eg-R1, but here the similarity is much lower than in the CSEP coding region and their up- and downstream regions (Figure6). There is an abrupt change in the level of identity from approximately 97–99.5% to 90% or below at the point where the sequence of the two retro-transposons starts. This pattern indicated that local duplication events between the retro-transposons are likely to have taken place by unequal crossover, possibly mediated by the repetitive DNA sequences including a high-copy repeat previously identified in the wheat powdery mildew fungus (AJ002007.1). In addition to this case, four highly similar CSEP gene pairs from families 8 and 30 were analyzed for the content of the flanking genomic regions and again repetitive DNA sequences were present close to the CSEP genes and the patterns are to some extent conserved between the paralogs. However, in these instances it was not possible to identify an exact breakpoint using the level of sequence similarity as it was for family 7 (Additional file26). The flanking genomic regions of several other highly similar CSEP pairs were analyzed. In general they are surrounded by repetitive DNA sequences and regions of high sequence similarity only extended ~1 kb or less up- and downstream of the exons. Genome clustering of eight CSEP paralogs from family 7 on two sequence scaffolds. A: Correlations between the phylogenetic relationships based on nucleotide sequences of CSEP paralogs from family 7 and their locations on the genomic sequence scaffolds 005496 (red) and 005502 (blue) indicated with dotted lines. Only the relevant parts of the sequence scaffolds (scale bar) are shown. The colour code of the CSEPs refers to the genomic organization shown in panel B. B: Schematic illustration of the genomic organization (encompassing about 5 kb) of the eight CSEP paralogs with the retro-transposable elements Egh24 and Eg-R1[15, 16]. The percentages of nucleotide sequence identity in pairwise comparisons are indicated and abrupt changes in sequence similarity are indicated with vertical dashed lines in red. The colour code of the CSEPs refers to the phylogenetic tree shown in panel A. Scale bars represent lenghts of DNA in base pairs. Here we report the identification of 491 CSEPs in the B. graminis genome, nearly doubling the number previously described. We explored systematically the evidence that the proteins encoded by these genes have effector-like properties using bioinformatics tools and expression studies. This work will facilitate the future investigation of their functional relevance in the interaction between the fungus and its host barley. The typically short ORFs, the unrelatedness of their gene products to known proteins and the tight association of CSEPs with retro-transposons (see below) render the identification of CSEPs in the large and highly repetitive B. graminis f.sp. hordei genome a challenging task. Although our bioinformatics pipeline converged after three rounds of iteration on a set of 491 CSEPs, suggesting saturation, we cannot exclude the possibility that some CSEPs escaped our attention and are missing in the present analysis. Since we deliberately focussed our CSEP prediction on genes coding for proteins with no recognizable counterparts outside the powdery mildews, we also cannot exclude that some proteins with N-terminal secretion signal and identifiable sequence similarity to polypeptides in other species (e.g. secreted proteases) exert an effector function during B. graminis pathogenesis. The clustering of CSEPs into families of paralogs (Figure2, Additional file4) suggests that CSEPs have gone through iterated rounds of gene duplications during evolution, and some of them are now amongst the largest gene families in B. graminis; in fact, overall CSEPs represent >7% of the protein coding genes in the B. graminis genome. This is a remarkable testimony to the importance of CSEPs in the powdery mildew fungi, particularly when taken together with the loss of a large number of conventional ascomycete genes and reduction in gene family size observed in this fungus. Since very few CSEPs have recognizable orthologs in the genomes of the two powdery mildew fungi, Golovinomyces orontii and Erysiphe pisi, representing other genera, we conclude that proliferation of CSEPs occurred after the separation of B. graminis from the dicotyledonous plant-infecting mildew lineage some 75 million years ago. CSEPs have since undergone rapid evolution and diversification. It will be interesting to correlate the CSEPs to orthologs in other B. graminis “formae speciales”, for example the wheat mildew fungus B. graminis f.sp. tritici, to relate CSEP differentiation with the evolution of host specificity and analyse the variation between CSEPs of extant isolates. Expression of effectors in the interaction between the obligate biotroph B. graminis and its host is expected to occur either in the appressorium and penetration peg or in the haustorium to be able to manipulate the plant. Indeed, we found that a large fraction of the CSEPs showed a significantly higher expression in haustoria compared to the epiphytic tissue isolated at five days after inoculation (Figure2). This was further corroborated by the observation that expression of more than two thirds of the 97 CSEPs identified as proteins by mass spectrometry was only detected in haustorium-containing epidermis (Figure2). In general, there was a clear congruence between the EST, the RNAseq expression and proteome data. Haustorium-specific effector expression is expected in order to suppress defence throughout the fungal life cycle. On the other hand, we also predict that some CSEPs may be expressed very early during penetration and these might already be present in the germinating conidia and exert their function before haustoria are formed. Unfortunately, there is only limited transcript data available from conidia at the stage of penetration, but maybe the larger CSEPs (300–400 amino acids), belonging to the three largest families and in general showing low transcript levels (Figure4) have functions at the earlier stages during infection. Here a low relative abundance may suffice due to the narrowly focussed area at the tip of the penetration hypha where the protein needs to act. Diversification through positive selection for amino acid changes has occurred in many of the families of paralogs and points to adaptive modifications (Figure3 and Figure4, Additional files11,12 and13). These may have resulted in increased virulence and/or avoidance of R-protein mediated recognition. Measuring positive diversifying selection is only possible in families where the coding sequences can be aligned with sufficient confidence and many of the CSEPs have diverged so much that they are too different for a reliable analysis. We may therefore have underestimated the degree of positive selection across the CSEP superfamily. In any case, the incidence of diversifying selection found here shows that it is a widespread and fundamental process in the evolution of B. graminis CSEPs as also demonstrated in other plant pathogenic plant pathogens[20, 21]. However, we also find families (e.g. families 7, 9, 14, 17 and 26) showing only purifying selection. In these cases, CSEP evolution evidently favoured conserved structures to exert their functions. The CSEP families can be grouped in two main categories based on a number of characteristics (Figure4). One group includes approximately 180 short CSEPs. These: 1) are typically 100 to 150 amino acids long; 2) have the strongest preferential transcript and protein accumulation in haustoria; 3) often have codons that show evidence of diversifying-selection, perhaps because they may be functioning in close interaction with plant targets and the R-protein surveillance system; 4) usually have only two or three cysteines and are thus not cysteine-rich as many apoplastic effectors suggesting that they may act inside the host cells. The other group of families comprises about 140 CSEPs, including those in the three largest families (1, 2 and 3) and several smaller families, and shares the following features: 1) they are relatively long CSEPs (300–400 amino acids); 2) they do not show high preferential expression in haustoria; 3) they have few codons subjected to positive diversifying selection, but in contrast they have many codons that have experienced pronounced purifying selection; 4) they often have several conserved cysteines predicted to form disulphide bonds in an oxidizing environment. The latter characteristic might indicate that their host targets are localized in the apoplast or extra-haustorial matrix. The structure prediction studies and 3D modelling showed that CSEPs generally have similar characteristics as known effectors described in other fungi and the proteins are detected preferentially in B. graminis haustoria in infected epidermis. On average, the global model quality scores for the generated 3D models were in most cases poor or low (p>0.05), which is expected since most CSEPs had distant or no detectable homology to known template structures. However, a number of the structural models were of medium (p<0.05) and high (p<0.01) confidence, and when the amino acid residues under positive selection were mapped on these models, they are often in the loop regions predicted to be exposed and thus possibly available for interactions with other proteins as part of their effector functions (Figure3D and Additional file18). It will be interesting to discover whether experimental determination of the 3D structure of these proteins confirms these predictions, particularly regarding the relative position of the residues under diversifying-selection. The cysteine frequency is higher in CSEPs than in average B. graminis proteins. However, it is much lower than that found among the cysteine-rich secreted proteins from Melampsora larici-populina and apoplastic cysteine-rich effectors from Cladosporium fulvum. The highest conserved cysteine frequency in B. graminis CSEPs, found in family 3, is only 2.9% and the presence of the cysteine in the YxC motif contributes significantly to the higher frequency of this amino acid in the CSEPs compared to other B. graminis proteins. It has been suggested that the many cysteines of the M. larici-populina effectors are important for the overall fold topology rather than for resistance towards degradation in the apoplast. However, given the conservation of the disulphide bond in the ribonuclease fold, it is most likely that this motif is important for protein stability. Our analysis shows a similar picture although in the CSEPs it is not only cysteines, but also other commonly conserved amino acids (e.g. glycine and proline) that are predicted to contribute to structural properties. The YxC-motif, first found in B. graminis CSEPs, is a common motif among effector candidates also in rust fungi, such as Puccinia graminis f.sp. tritici[6, 24], P. striiformis f.sp. tritici and Melampsora larici-populina[13, 22]. Here we showed that the B. graminis CSEPs have mostly an N-terminal YxC-motif, but in the longer CSEPs it can occur over the whole length of the protein. The functional significance of this motif remains elusive. However, a conserved host cell targeting sequence (RXLR-DEER) followed by C-terminal functional regions has been found in other plant pathogens, for example in the oomycete Phytophthora infestans. Using two different approaches (InterProScan and IntFOLD) we found that 72 of the 491 CSEPs have recognizable relationships to ribonucleases (Additional file7). This is possibly an underestimation as sequence variation in residues that are critical for the assignment to this polypeptide category will probably lead to false-negative predictions. It is interesting to note that the vast majority (54 of 57) of proteins in the B. graminis genome with domain IPR016191 (ribonuclease/ribotoxin) are CSEPs. There are numerous additional proteins encoded by the B. graminis genome that have a relationship to RNA metabolism/turnover. These include for example proteins with InterProScan domains IPR000504 (RNA recognition motif domain, 60-times present), IPR012337 (ribonuclease H-like domain, 35-times present) and IPR001247 (exoribonuclease phosphorolytic domain 1, 6-times present), but none of them is found in the CSEP set. The IPR016191 (ribonuclease/ribotoxin) domain thus seems to be a hallmark of the CSEP family, suggesting that it might be important for effector structure or activity, while other RNA binding or modifying proteins encoded by the B. graminis genome might have housekeeping functions. A secreted fungal ribonuclease appears to be the common origin of many CSEPs in different families, as an alignment suggests that 10–20 spaced and moderately preserved amino acids are conserved between ribonucleases and these CSEPs (Figure5). These amino acids are likely to play important structural roles in scaffolding the CSEPs, being located typically in the β-sheets or at the border between a β-sheet and a loop region. Meanwhile, we found that the regions with amino acids under diversifying selection are located in the loops and predicted to be exposed on the surface of the proteins. Although the ribonuclease-like proteins are unlikely to be functional as RNA-degrading enzymes since they lack critical active site residues (Figure5A), we speculate that some of these effectors could still be involved in interactions with host RNAs and modulate host immunity via this route. Alternatively, as extracellular ribonucleases are very stable molecules, highly resistant to proteolytic degradation, they may have had a rigid structure that could have been an ideal starting scaffold for evolving an effector arsenal, in which the loop regions were subjected to positive selection allowing the CSEPs to diversify and avoid recognition by host surveillance factors (R-proteins). A similar example of structural conservation among effector candidates has recently been found by Win et al., who showed that RXLR effectors of the Peronosporales (oomycetes) often share a WY-domain that is structurally conserved despite high sequence divergence between different plant pathogenic species. The genes encoding the CSEPs shown in Figure5A have a common relative intron location, further corroborating a common ancestor. Moreover, since this intron location is also shared in many other CSEP genes, it may be that a large proportion of the CSEPs have evolved from an ancestral microbial ribonuclease similar to ribonuclease T1. A model for CSEP gene amplification was suggested based on the observation that CSEPs belonging to the same family are very often clustered in the genome and in several cases separated by less than 10 kb (Figure6). This hinted that they evolved by gene duplication events due to unequal crossovers[27, 28]. Also in another biotrophic phytopathogenic fungus, Ustilago maydis, genes encoding small secreted proteins with unknown function were found in clusters, even though the spacing between those effectors was much shorter, possibly reflecting the general compactness of that genome compared to that found in B. graminis. Illegitimate recombination was found to be the major driving force in gene duplications in plants, for instance in the evolution of multi-locus resistance genes[30, 31]. This clustering is in contrast to the situation for the family of EKA genes, encoding another type of putative B. graminis effectors that have spread across the entire genome by means of a transposable element. We found that CSEP genes often are closely associated with two well-described SINE-type retro-transposons, Egh24, Eg-R1 and another high copy repeat (AJ002007.1) originally found in the wheat powdery mildew B. graminis f.sp. tritici, which are all very abundant in the genome. The genomic regions adjacent to CSEPs in most cases are flanked by these repetitive DNA elements and the pattern is conserved between the closest paralogs. Unequal crossover is mediated by highly similar sequences and therefore the retro-transposable elements are very good candidates for facilitating such events. In M. larici-populina tandem repeats of AvrM-paralogs are also flanked by transposable elements. Powdery mildews including B. graminis have lost the repeat-induced point mutation (RIP) pathway and this may have allowed extensive amplification of transposable elements in the genome. Our findings here suggest transposable elements have helped CSEPs to multiply and proliferate as described for the EKA effector gene candidates. If this is true, then the loss of the RIP pathway and resulting retro-transposon driven genome expansion could have conferred a selective advantage and facilitated evolution of powdery mildew fungi by potentiating proliferation of effector proteins. Here we have shown that many CSEPs are likely to have evolved from (an) ancestral extracellular ribonuclease(s) through a series of gene duplications followed by diversifying positive selection. A number of different models for the evolution of gene duplications have been proposed and they can be classified depending on how gene duplications affect fitness, whether there is positive diversifying or purifying selection and whether there is pre-existing allelic variation. Our observation that the transcript level of many CSEPs was high in planta is consistent with the view that the expression level is important for their function. For example, many effectors work by interacting with proteins where it matters to be present in abundance to inactivate their targets. Many effectors are also exposed to proteases leading to a fast degradation, so a high transcript level will be an advantage. A gene duplication resulting in two copies will often lead to a further increase in expression through a gene dosage effect and thereby increased fitness. Once duplicated, the genes can be subject to diversifying selection: indeed we have detected pronounced diversifying selection in some families. Overall this fits with the “diversifying selection model”, described by Innan and Kondrashov, explaining how gene families can evolve and result in new functions for the individual members. Our work is a further illustration of how a stable structural fold may act as a template for diversification. 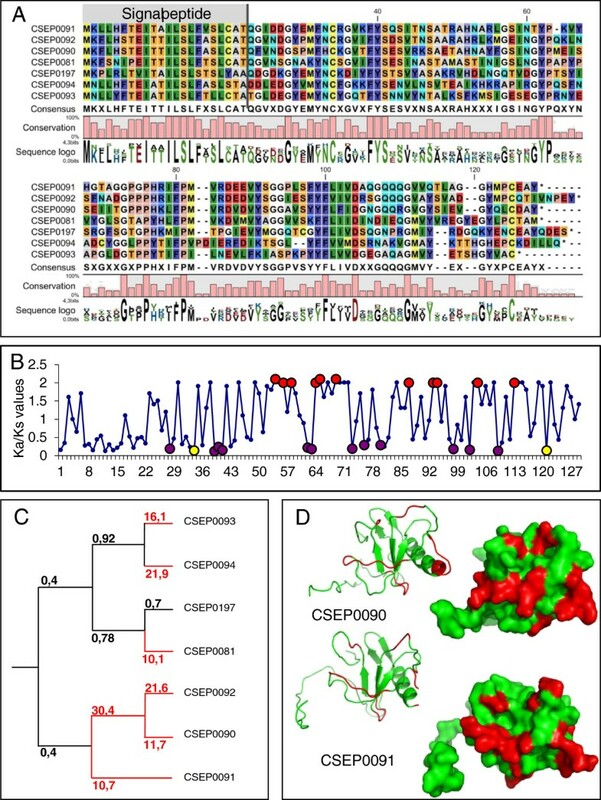 This comprehensive analysis indicates that CSEPs in B. graminis belong to a super-family of proteins, and it has validated the view that they are candidates for important effectors of pathogenicity. The findings from this work provide a solid foundation for proceeding with a systematic functional genomics analysis. Furthermore, we propose a model of how these proteins evolved from a gene coding for a secreted ribonuclease by gene duplication associated with repetitive elements generated by retro-transposon activity. Subsequent diversification yielded a diverse palette of effector functions. We speculate that powdery mildew fungi benefit from an efficient repertoire of secreted effector proteins able to suppress host defence for the benefit of the fungus. CSEP genes were identified by the same criteria as described previously, except that predicted transmembrane domains overlapping with the predicted N-terminal secretion signal were discarded due to the similarity in amino acid patterns between the two signals. New CSEP candidates were found by identifying and annotating genomic candidate regions based on self-BLASTs or ORF predictions. We first performed BLAST searches against the genome (TBLASTN, e<10-05) using the previously identified 248 CSEPs (excluding two CSEPs with high similarity to transposable elements) as a query to identify candidate regions encoding other CSEPs. These candidate regions were then manually annotated using the protocol described. The above procedure was repeated with the newly identified genes until no new candidate regions without annotated genes could be found. In parallel, all predicted ORFs with an N-terminal secretion signal and transcriptional evidence were taken as candidate regions and manually annotated. Contain a secretion signal as predicted by SignalP V3.0 (D-cutoff values > 0.5). The Markov Cluster Algorithm (MCL) was used to identify clusters of similar proteins based on a graph constructed by a self-BLAST of the entire proteome or the CSEPs (BLASTP, e<10-10). The protocol as described by Enright et al. was followed with I = 2. For the CIRCOS plot shown in Figure2 a multiple sequence alignment of the conceptual CSEP amino acid sequences was established using ClustalW (http://www.ebi.ac.uk/Tools/msa/clustalw2/). The alignment file was used for phylogenetic analysis via the phylogeny option of ClustalW (http://www.ebi.ac.uk/Tools/phylogeny/clustalw2_phylogeny/). The neighbour-joining algorithm was chosen to generate a tree file that was subsequently fed into MEGA4 (http://www.megasoftware.net/) for visualization. For generation of a bootstrap consensus tree, ClustalW alignment and neighbour-joining analysis (100 replicates) were performed with MEGA5. CSEPs were BLAST-searched against the B. graminis EST resources available at COGEME, the phytopathogenic fungi and oomycete EST database, where most B. graminis sequences are from conidia and the data-set previously published[6, 10] (Additional file8). The abundance of CSEP RNA was determined at two stages of B. graminis development: haustoria in infected barley epidermis and in the epiphytic structures (e.g. surface runner hyphae, conidiophore foot cells, conidiophores, conidia) isolated at five days after inoculation of two week-old barley primary leaves. The samples were equivalent to those used in our previous publication and the analysis was carried out as follows. Three independent biological replicates were used for each stage. Total RNA was extracted and partially depleted of the ribosomal RNA (RiboMinusTM Eukaryote, Life Technologies, Carlsbad, CA, USA). Whole transcriptome libraries were prepared from each sample (SOLiD Whole Transcriptome Analysis Kit, Life Technologies). Libraries were barcoded and pooled together before emulsion PCR amplification. One flow-cell was loaded with 316 million beads, and 50 bp fragments were sequenced with a SOLiD version 3 instrument (Life Technologies). Bowtie (version 0.12.7) was used for the mapping of sequence reads to the B. graminis genome, using the .cfasta .qual as the input files and output piped to a Binary Alignment/Map file (BAM). Due to the highly repetitive nature of the genome, the Bowtie mapping settings were restricted to allow one mismatch and uniquely aligned reads only. The SortSam module of the Picard sequencing tools (version 1.56) was used to order the reads in the BAM files according to their genomic position. The CoverageBed utility from the BedTools (version 2.11.2) collection was used to determine the number of read counts per gene, using the B. graminis gene annotation in a BED format. The read counts for each of the six biological samples were imported into R statistical software (http://www.r-project.org/) and pre-processed and analyzed with the R package EdgeR. EdgeR transforms the gene expression count data to pseudo count values using a quantile-to-quantile normalization, followed by an exact test for a negative binomial distribution to determine differentially expressed genes. The p-value was corrected for multiple testing using the False Discovery Rate (FDR) using the Stats R package. Using this approach, 2110 genes out of a total of 6865 genes were found to be differentially expressed at the 1% FDR level. The genome assembly of Blumeria graminis f.sp. hordei strain DH14 (http://www.blugen.org/) was used to generate a protein open reading frame (ORF) database based on the gene annotations submitted to NCBI (http://www.ncbi.nlm.nih.gov/bioproject/28821). The mass spectrometry data used for this work was acquired from in-solution tryptic digest preparations of protein extracts from two different tissues, sporulating B. graminis hyphae and infected barley epidermis containing B. graminis haustoria. The data are deposited in the PRIDE database (accession numbers 26886 to 26889;http://www.ebi.ac.uk/pride/). In order to identify the occurrence of CSEPs in the relevant datasets, we re-searched Mascot generic files (*mgf) of these datasets with the Mascot search engine vs. 2.3.02 (Matrix Science, London, UK). This was done simultaneously against the following three databases: B. graminis protein database, B. graminis CSEP database, and contaminants database as described in, with the exception that oxidation of methionine and proline was selected as variable modification. Peptide scores and estimation of the FDR were assigned using the Percolator algorithm within the Mascot software. For identification, a protein required two or more unique peptides with a score above the identity score threshold (p <0.05) as calculated by Percolator. Following manual inspection, it was observed that with the exception of an actin and a glucose-6-phosphate isomerase protein, B. graminis proteins did not share any identified peptide sequences with proteins from the contaminants database. In the case of the actin protein, it was deduced that the protein was of B. graminis origin rather than from contamination since the total protein score was higher for the B. graminis actin than for the putative human actin contaminant. The FASTA formatted sequence files for the CSEPs were submitted to the IntFOLD server, which combines a suite of advanced tools for the prediction of protein structure and function from amino acid sequence. The IntFOLD server comprises automated methods for fold recognition (IntFOLD-TS), domain prediction (DomFOLD), disorder prediction (DISOclust), binding site residue predictions (FunFOLD) and 3D model quality assessment (ModFOLD)[11, 43, 44]. For each protein, the PDB header files of the top structural templates were scanned for keywords referring to functions, such as RNAse, ribonuclease and hydrolase, and their frequencies were recorded. Finally, the best 3D models for the CSEP families with confident (medium to certain) structure predictions (families 5, 12, 21, 22 and 23) were downloaded from the IntFOLD server. Each model was then visually inspected and the residues that were found to be under positive selection were highlighted using PyMol (http://www.pymol.org). The individual amino acid frequencies and their occurrence within different sequence/structural features were calculated. The PSIPRED secondary structure prediction method[45, 46] was used to calculate the frequencies of residues in each of the secondary structure elements (helices, strands or loops). The pfilt method was used to calculate the frequencies of residues in coiled-coils, the frequencies of residues in transmembrane helices and the frequencies of residues in low complexity regions. InterProScan analysis was conducted to identify functional domains. Disulphide bonds were predicted with the tool Cysteines Disulfide Bonding State and Connectivity Predictor Disulfind (http://disulfind.dsi.unifi.it/). In a previous study, the IntFOLD server was used to structurally and functionally annotate proteins found in specific tissue types of B. graminis: the haustoria (the feeding and effector-delivery organs of the pathogen) and the sporulating hyphae. The B. graminis data were then compared with sample sequence data sets obtained from Saccharomyces cerevisiae. In the present study, we compared the CSEP predictions with the data obtained from our previous study, as well as with a data set of known fungal effectors obtained from the literature. Thus, the following sequence data sets were compared with the CSEP data: Haustoria_only, 71 B. graminis proteins that were found to be exclusively expressed in haustoria; Hyphae_only_random, a random sub set of 71 B. graminis proteins that were found to be exclusively expressed in hyphae; Hyphae_only_length_dist, a sample of 71 proteins exclusively found in hyphae with the same distribution of lengths as the Haustoria_only proteins; Yeast_random and Yeast_length_dist, as above but for subsets of proteins from yeast; Hyphae_plus_Haustoria, the subset of 194 B. graminis proteins found in both hyphae and haustoria tissue, Known_Fungal_Effectors, the set of 39 verified fungal effectors identified from the literature; proteome_minus_CSEPs, the B. graminis proteins excluding the CSEP set. The length distributions of the proteins in each subset were also visually inspected to ensure that the sampling was representative with regard to protein size. Wilcoxon signed rank sum tests and Fisher’s exact tests were carried out using R (http://www.r-project.org) in order to measure the statistical significance of differences between the CSEP prediction data and those from each of the comparison sets. Amino acid alignments of CSEPs were carried out with the CLC main workbench (Aarhus, Denmark). Positive selection was studied within the families of paralogs by three methods. Codon-based z-tests of selection both as a pair-wise analysis and as an overall analysis were done in MEGA version 5 using the modified Nei-Gojobori method with the transition/transversion ratio set to 1. To identify which codon sites were under positive or purifying selection we used a Bayesian inference approach and employed the Selecton server (,;http://selecton.tau.ac.il/) to run model M8 and when positive selection was detected to run the model M8a versus model M8 as a statistical test of significant positive selection. Finally, we used the method 7 described by Liberles to calculate the ratio of non-synonymous (Ka) to synonymous (Ks) nucleotide substitution rates of pairwise combinations of genes or branches of gene phylogenetic trees, which is available on-line athttp://services.cbu.uib.no/tools/kaks. This method is incorporating codon bias and focusing on the branch-points reflecting the evolution of the individual paralogs in the families, pinpointing the events of positive selection to specific branch points of the phylogenetic tree. A codon usage table for B. graminis was employed (http://www.kazusa.or.jp/codon/,). The sequence identities in the coding and non-coding sequences of close paralogs of family 7, 8 and 30 were calculated by comparing the genomic regions 500 bp upstream to the start codon, the exons and the intron and then 500 bp after the stop-codon. The B. graminis f.sp. hordei genome sequence has been submitted to GenBank under genome project ID 28221. Submission of a revised assembly and annotations is in progress, and will be accessible under the same project ID. Pending the completion of the submission process, the updated sequences and annotations can be accessed athttp://www.blugen.org/index.php?page=data. The RNASeq analysis is available from ArrayExpress (http://www.ebi.ac.uk/arrayexpress/) under accession E-MTAB-682. The full structural annotation data relative to CSEPs is available athttp://www.reading.ac.uk/bioinf/CSEPs/. Mass spectra, MASCOT and associated metadata can be retrieved from the PRIDEdatabase;http://www.ebi.ac.uk/pride/. This research was funded by the Danish Council for Strategic Research, the Max-Planck society and Rheinisch- Westfälische Technische Hochschule Aachen core funds and the Biotechnology and Biological Sciences Research Council-UK (BB/H001948/1). CP, RP and PDS, designed this study. EVLvT, JCA, GB and TAB, performed the computational and bioinformatic analysis. LJM and LVB, designed and performed the structure and function predictions based on structural analysis. LVB and RC, conceived and designed the proteomics analysis. XL, TM, RW, RP and PDS, annotated the CSEP genes. CP, HTC, RP and PDS, wrote the paper with contributions from all the other authors. All Authors read and approved the final manuscript.